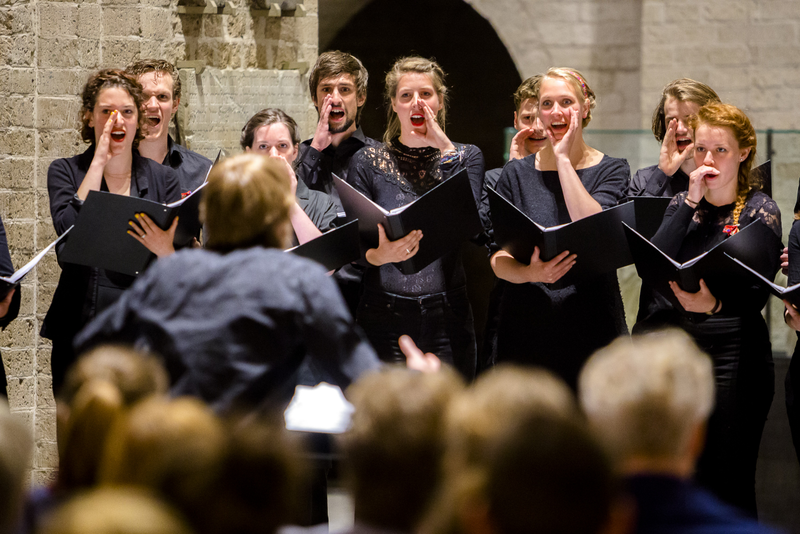 The Dwarslopers Festival is concluded with the concert of the Utrecht Chamber Choir JIP. During the concert 175 Dwarslopers and musicians from the Middle East let their voice be heard in a varied program. In JIP10 (the tenth project) Kamerkoor JIP examines the theme of identity by singing music from areas where cultural identity is experienced differently than in the Netherlands. In addition, there is music specially composed for the aniversary project. Atmaca project is a perfect reflection of diversity. The four members not only have a different nationality, they study at three different departments of Codarts. The Syrian clarinetist Ghaeth Almaghoot struck the Greek guitarist Alexander Chrysostomides and the Bulgarian / Turkish percussionist Veys Dzhesur soul mates with a shared passion: to give traditional music from the Eastern Mediterranean an exciting new impetus. Bass guitarist Karel van der Eijk from the Netherlands joined the three of them wholeheartedly. The seemingly clashing sound worlds – the warm-blooded tone of Almaghoot’s clarinet versus the cutting edge of Chrysostomides’ Telecaster – create in dialogue with the unusual rhythm section a wonderful hybrid that melts every thought of tight boundaries like snow in the sun. Mireille Bitter Syrian soprano singer, founder of Mozaiek Ensemble and a Master student at the Conservatory of Amsterdam in the classical music department. Played Cherubino from Le Nozze di Figaro by Mozart in the opera house in Syria led by Julius Kalmar and Missak Baghboudarian 2010. She sang the soprano role in Requiem Mozart 2011, Mass G-dur Schubert 2013, Stabat Mater by Karl Jenkins 2015, Liebeslieder – Brahms 2016 and the solo soprano in the opera: “it is here if you see it here if you hear it” at the National Opera & Ballet 2016. Worked with the Syrian Women Oriental Ensemble and with several oriental bands and ensembles inside and outside Syria. Won numerous awards for best singer in Kitharet Al Rouh festival in 2000, and best Oud player for 2004. Wasim Arslan The young legendary musician; with his voice like a nightingale and sensitive soul, Wasim Arslan has been through the dark side of life, he experienced and survived a lot during the war in Aleppo, Syria. Yet he kept challenging the horrifying circumstances inspired by music and motivated by the smiles around him. To pursue a dream – after discovering his voice – he did a vocal course with the best vocalists in Aleppo – Safwan Abed – In the age of 21.Wasim feels a sense of responsibility to represent his home country Syria, and to give his music and talent a bigger role in uniting people and building bridges at a time of war and division. He has been performing at several events in the Netherlands such as Mysteryland, What Design Can Do? in the Muziekgebouw theater and Global Goals Jam, leading up to the creation of Sarsaria Band, alongside with another four international talents.